From now on I will do an introduction to every model I buy or receive on this blog. The series will be called: "On the WorkBench" as you could see in the title of this post. 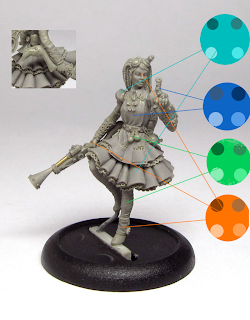 The first edition will be about an amazing limited edition figurine from the talented Sebastian Archer's company Guild of Harmony: Steampunk Alice and her Clockwork Rabbit. He got the 3rd place overall at last year's Crystal Brush with this piece! This miniature is limited to 400 castings and I received the 160th cast. Alice was carefully packed in a padded envelope and within that surrounded by bubble wrapping. Everything arrived intact and within 1 week after shipping to my pleasure! The resin cast was the best I have seen so far! Such an amount of detail on so small a figure. After removing the mould lines and cleaning up most of the areas on the miniature, I took some more photos. Happy to have such an amazing figure! The colour scheme I'm going to use on her won't be that much different from the one Sebastian used on his original sculpt, since in my opinion it's one that's very fitting for the figure and I like it really much.